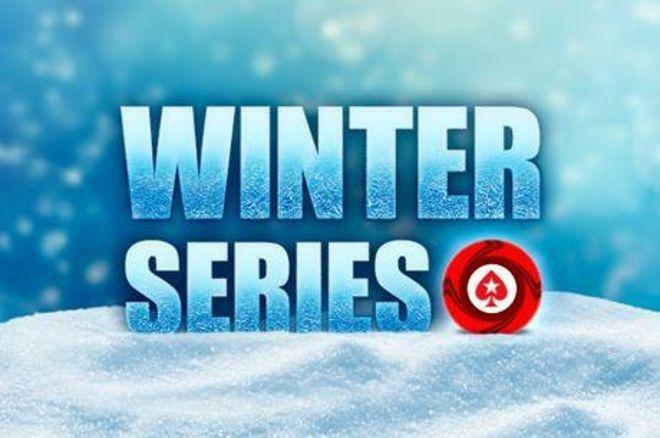 Canada's "freezeplay" won $363,177 by taking down the $2,100 Winter Series Main Event at PokerStars. The $25 million guaranteed Winter Series at PokerStars is complete with all 152 champions crowned. A quartet of Main Events wrapped up the series this weekend and, as you would expect, the winners walked away with some massive prizes. Day 2 of the $2,100 Winter Series Main Event ended with only 89 players still in contention for the title. With 134 players paid in this event, the 89 returning players were already in the money and had locked up $6,001 for their efforts. Such luminaries as Dominik “Bounatirou” Nitsche, JC “PrtyPsux” Alvarado, Simon “C. Darwin2” Mattsson, and Kristen “krissyb24” Bicknell all busted on Day 2, the latter falling in 22nd place for $11,919. The final table bubble burst with a double elimination. “Ruis Maker” lost on one table when his ace-nine lost the pocket nines of “needdollarz” and on the other table “adkaf” got his chips into the middle with a pair of nines and lost to the ace-queen of “KRab42” after the board ran out with quad sevens on it. This double exit meant the least anyone would take home was $41,288 and this is the sum awarded to Romania’s Alex “steakaddict.” Papazian. The Romanian committed his last 11 big blinds with queen-jack and couldn’t get there against KRab42’s dominating ace-jack. Seventh place went to Juanki “B4NKR0LL3R” Vecino who got his chips in good with ace-king against the ace-queen of “ikkedus.” Vecino even paired his king on the flop, but the queen of diamonds on the river put four diamonds on the board and ikkedus held the ace of diamonds in his hole cards. Russia’s needdollarz needed chips and attempted to get them by moving all-in with suited ace-seven for 13 big blinds. Alexandros “mexican222” Kolonias isolated the shove on the button with a pair of black kings and a queen-high board sent needdollarz to the rail. Each of the five remaining players was now guaranteed a six-figure score; it was Russia’s “Flying Smile” who got his hands on the first of these big prizes. Flying Smile busted in fifth place when KRab42 raised from the cutoff, freezeplay called in the small blind and Flying Smile called in the big blind. Both blinds checked on the queen-deuce-ace flop, KRab42 bet 397,500, freezeplay check-raised to 1 million and Flying Smile jammed for 4.1 million. freezeplay called with ace-queen for top two pair, crushing the ace-nine of Flying Smile. Running nines didn’t happen and Flying Smile was gone. Ikkedus then bust a couple of minutes later when his jack-ten succumb to the suited ten-nine of freezeplay when the latter caught a jack-high straight on the river. Heads-up started with freezeplay holding a near two-to-one chip advantage over mexican222 yet he asked if his opponent wanted to check the numbers for a potential deal and you can see why as there was $97,000 in cash on the line. Mexican222 declined and play continued. The final hand of the tournament saw mexican222 move all-in on the river of the board and freezeplay instantly call him. Mexican222 showed for trip eights, freezeplay the for a full house, and the Winter Series Main Event title went to freezeplay, as did the $363,177 first-place prize and a $30,000 PokerStars Players Championship Platinum Pass. The $215 Winter Series Medium Main Event ended in a five-way chip with each of those five PokerStars players walking away with more than $121,000 each. Day 1 saw the 10,644-strong field reduced to 396 players over the course of 27 levels and it took another eight hours of play on Day 2 before the nine-handed final table was set. Among the finalists were talented duo of Sweden’s Andreas "gnetaren" Samuelsson who had reached the final of the Super Tuesday no less than six times, and Rasmus “mrvogt” Vogt” who has $3.4 million in cashes at PokerStars. Brazil’s “tratorpoker” was the first casualty of the final table, his pocket jacks proving no match for “SmartyFish4’s” ace-king, before “WTFDinoD” bust at the hands of “mrvogt” a couple of orbits later. The waters grew less shark infested when gnetaren’s steal attempt with king-four of hearts came a cropper against the pocket eights of mrvogt to leave only six players in the hunt for the $284,422 top prize. Poland’s “rudisf” crashed out in sixth place at the hands of Netherlands’ “The Haamer” and the final five players paused the tournament clock to discuss a potential deal for the remainder of the prize pool. Some 20 minutes later, a deal was struck that left two percent of the prize pool and a $30,000 PokerStars Players Championship Platinum Pass for the eventual champion. “The_Wako7172” was the first of the deal-makers to fall; his ace-king lost to the red kings of SmartyFish4. “NoTilit” then bust in fourth place before the dangerous mrvogt fell in third place to send the tournament into the heads-up stage. The chip stacks of the final two players were almost level, in fact less than a single big blind separated the pair. Yet the battle was over quickly with the final hand seeing SmartyFish4 holding against the of The Haamer with the money going in on the river of the board.